(KZN.RU, February 11, Alina Berezhnaya). Ilsur Metshin, the Mayor of Kazan, urged to strengthen the work on emergency prevention and carry out preventive measures for fire safety in schools more often. Ferdinant Timurkhanov, the head of the Civil Protection Directorate of Kazan, report on the work at the Business Monday today. Ferdinant Timurkhanov spoke about the results of the work of the administration last year and shared the plans for the current year. Thus, rescuers from the Kazan Civil Protection Directorate had 861 calls in 2018, where 288 people were rescued, and provided assistance to 465 victims. The number of fires in the city has slightly increased. In 2018, 652 fires occurred in Kazan (598 – in 2017). The amount of death on the fires remained at the level of the indicators of previous years: 34 people. Last year, particular attention was paid to the safety of residents on water bodies. During the swimming season of 2018, 10 people were rescued on the beaches and recreation areas, including 4 children. There were no drown people registered in the sanctioned recreation places on the water. The work to ensure the safety of citizens on the water continued from the beginning of the ice formation. Thus, 90 patrols have been conducted in the waters of the Volga and Kazanka rivers, during which the rescuers had 210 conversations and distributed 320 brochures. The head of the Civil Protection Directorate said that much attention was paid to preventive measures last year. Thus, Kazan rescuers conducted 471 practices on social facilities and objects of the city’s economy. Also, civil defense courses were organized, which were attended by 132 officials and 586 heads of training groups in civil defense and in the field of emergency prevention. F. Timurkhanov reminded about the mass evacuation in the schools of Kazan, which took place on January 31. The speaker noted that the children left the premises in a short time in all schools. “Within a month, we will assign a temporary accommodation center near each kindergarten and school. Such objects could be nearby shopping centers or establishments located at a distance of 50 meters”, said F. Timurkhanov. 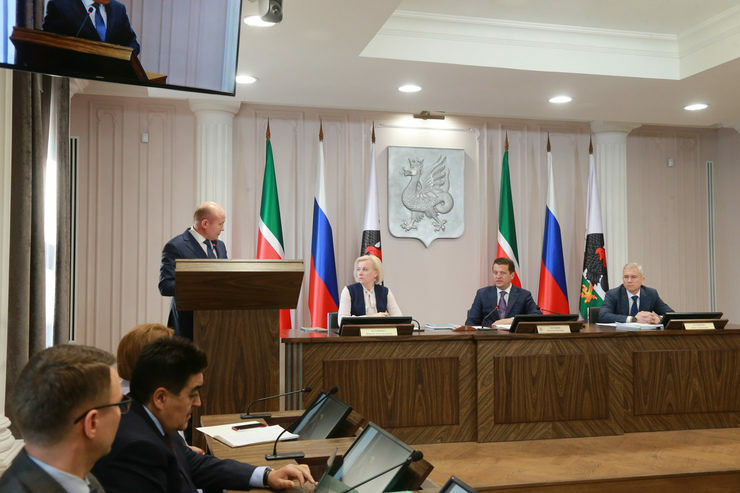 “Analysis of emergencies and accidents in Kazan shows that in order to reduce the number of fires, it is necessary to continue preventive work among the population on fire and accident prevention”, said F. Timurkhanov. I. Metshin noted the coordinated work of the relevant Department. “The Civil Protection Directorate is our fighting squad. Our city rescuers are always on the alert for floods, fires, and other emergencies. It is gratifying that a large number of exercises were held last year”, said I. Metshin. The head of the city noted the need for further preventive measures. “It is important that preventive measures take place everywhere so that our children are ready in case of a fire. The population should know what to do in emergency situations”, concluded the Mayor.